This is the page for people like Debi Hillebrand, above, used to be. She was an aspiring innkeeper member of MBBA for several years while her Lewis House Bed and Breakfast in Whitehall was being extensively updated. 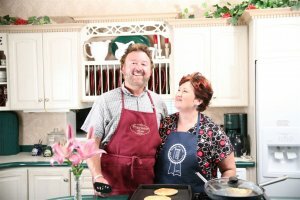 If you’re wondering how to start a bed and breakfast, Debi will tell you that the information she gleaned and the contacts she made as an aspiring member have been invaluable to her success as an innkeeper. Starting your own bed and breakfast can be a daunting task, but with the help of our members and their resources, the Michigan Bed and Breakfast Association can assist you in making your dream a reality! Scroll down for shadowing opportunities, to apply for membership as an aspiring innkeeper, and for great educational resources. Updated 11/7/2017. We are in the process of building now, and enjoyed seeing everyone at the “Positively Innkeeping” conference in Grand Rapids. We are just starting to explore the adventure in innkeeping. At this point, just looking for potential inns to purchase and take over. Very beginning stages. Love Saugatuck area but the sale prices are so high. Will keep looking for the right fit. We are renovating an old home in Port Austin and hope to be ready to open by summer of 2019. We are in the process of finalizing our name, obtaining domain names, etc. We own a 150-year old Italianate home in Dundee and will be remodeling and installing extra baths. We plan to open in the spring of 2019. We have a 3 to 5-year plan to own a turn-key B&B property along Lake Michigan. For a membership application, click here or call or email the office. Note: if you open your inn and join as an innkeeper member before your aspiring membership year is over, we will pro-rate your $50 membership fee against your B&B membership dues. Find B&B Purchase Opportunities Here. These seasoned innkeepers invite aspiring innkeeper members to “shadow” their operations and learn innkeeping firsthand. Learn to * Choose a location and make it your own * Create a profitable business plan * Decorate and renovate your property * Market your property for maximum occupancy. Authored by Mary White, President, BnBFinder.com. Reading material compiled for the association’s Aspiring Innkeeper Workshops. Offering arguably the most complete resource in the Great Lakes region, this not-for-profit association offers start-up kits, seminars and many other resources for aspiring innkeepers.